On Saturday, September 26, the Tulalip Heritage Hawks (0-2) football team played their first home game of the season at Marysville Pilchuck field versus the Seattle Lutheran Saints (2-1). Last year the Hawks beat the Saints in dominate fashion, winning 58-0. In the Hawks opening game of the 2015 season, played on September 3, they traveled to Evergreen Lutheran and came away with a 32-62 loss. After a week’s worth of practice the team was looking forward to playing Entiat on Saturday, September 15. Instead they had to forfeit the game due to having more than half the team academically ineligible to play, resulting in not having enough eligible players to field a team. Against the Saints of Seattle Lutheran, the Hawks were able to field nine players, just enough to field a team and have one substitute player. Important to note, that with only nine players that meant all of the boys would be playing both offense and defense for pretty much the entire game. On the second play of the game the Hawks sent #24 Robert Miles on an inside blitz and he tackled the Saints running back in the back field for a 3-yard loss. Two plays later the Hawks came away with a clutch 4th down stop and took over on the 48-yeard line, in Saints territory. It didn’t take long for the Hawks to capitalize on the turnover, as Rob threw a 29-yard touchdown pass to wide receiver #82 Braxton Lake to score the game’s first points. The Hawks opted to go for a 2-point conversion and Rob connected again with Braxton to take an 8-0 lead only three-minutes into the opening quarter. The Saints responded in kind by marching down the field and scoring on a touchdown pass, then converting the 2-point conversion to tie the game at 8-8. Attempting to catch the Hawks by surprise, the Saints attempted an on-side kick, but #22 Nate Hatch managed to corral the ball and possession at the Saints 45-yard line. Using a mix of short dink and dunk passes with their running game, the Hawks were able to get into the red zone. On a 2nd down play from the 16-yard line, Rob dropped back to pass, not seeing anyone open, threw a pump fake, tucked the ball and ran it into the end zone. The Hawks again went for 2-points and Rob connected on a pass to #15 Nashone Whitebear to give the Hawks a 16-8 lead. Less than 20 seconds later the Saints tied the game at 16-16. Their star player #23 J.J. Young had a 60-yard kickoff return to put his team in the red zone. On the next play the Saints would score a touchdown and follow it up with converting the 2-point conversion. On the Hawks next offensive possession they were forced to punt, and the Saints scored quickly to take a 22-16 lead over the home team. The Saints 2-point conversion failed as Braxton tackled their running back just short of the goal line. Opting to go for the onside kick once again, the Saints managed to recover the ball after it bounced over the outstretched hands of Nate and #17 Dominic Joseph. Fortunately for the Hawks, in this division the ball is marked down where it’s recovered (runner is not allowed to advance after recovery) otherwise the Saints would have scored an easy touchdown off the recovery. The Hawks defense did a great job on the next series containing the Saints skill positions and tackling on first contact, but the Saints still managed to work the ball down the field. After a nice throw and catch, the Saints easily scored from 1st and goal from the 1-yard line. Opting not to follow the Seahawks lead in the last super bowl, the Saints ran the ball from 1-yard line to score and go up 28-16. The Hawks defense stepped up and prevented the 2-point conversion to keep their deficit at 12-points. Yet again, the Saints attempted an onside kick that was collected by #57 Lloyd McLean, giving the Hawks good starting field position at their own 47-yard line. The Hawks ran it on back-to-back plays before Rob dropped back on a key 3rd down and bombed out a 40-yard throw to Braxton who caught it and looked to have a for sure touchdown, but was tackled just short at the 2-yard line. On the very next play Rob switched to running back and took the handoff in for an easy score. The 2-point conversion was unsuccessful, but the Hawks had cut into their deficit now only trailing 22-28. In an interesting move to keep their momentum going, they took a page from the Saints book and attempted a surprise onside kick. Unfortunately, a Saints player recovered the ball and ran untouched to the end zone, followed by a successful 2-point conversion. Just like that, in a matter of seconds, the Hawks were now trailing 22-36. The Haws leaned heavily on the playmaking abilities of Rob on their next offensive series. He seemingly accounted for every yard on the drive and picked up two 4th down conversions with his legs. After a personal foul penalty on the Saints, the Hawks were in business in the red zone, having a 1st down on the 15-yard line. There was no doubt what the play call would be, as Rob took the hike and immediately ran to the left edge and running right by four Saints defenders and stiff arming his way in for a touchdown. The 2-point conversion was unsuccessful, but the touchdown capped off a great drive for the Hawk. The score was now 28-36 with under 2 minutes remaining in the 1st half. #24 Robert Miles scores his 4th touchdown of the game, none more impressive than this 15-yard scamper with a stiff-arm at the end. Considering how many big plays the Saints had and the Hawks playing with only one substitute player, it was amazing to see the Hawks keep grinding away to keep the game within reach. Notably absent on the Hawks next defensive series was Rob, who was on the Hawks bench receiving attention to his left side. He had taken a nasty hit going for the failed 2-point conversion and immediately walked gingerly to the sideline afterward. The Saints wasted no time taking advantage of Rob being on the sideline as they ran three straight run plays right into the heart of the Hawks defense to score a touchdown and complete the 2-point conversion. At halftime the Hawks trailed the Saints, 28-44. Coming out of halftime there was bad news coming from the Hawks side as it was announced Rob was out for the remainder of the game, leaving an already short-handed team without its best player on offense and defense. The 3rd quarter was an absolute disaster for the Hawks as they allowed two punt returns for touchdowns and threw a pick-6 on offense. Fatigue was for sure a factor at his point in the game and having to switch players in and out of QB in Rob’s absence made it difficult to get any momentum going. At the end of the 3rd quarter the Hawks were now trailing 28-65. The Saints, having 20+ players on their active squad, and 37-point lead used the 4th quarter to give them 2nd string players some game action. Meanwhile the Hawks having no subs at this point had to dig deep to finish the game out strong. 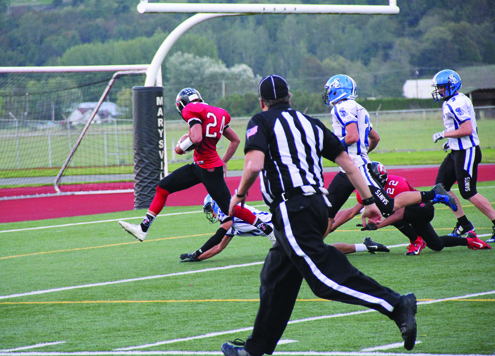 Taking advantage of very good field position following a 50-yard kickoff return by Braxton, the Hawks’ Dominic Joseph turned a broken play into a rushing touchdown. Following a failed 2-point conversion, the score was 34-65. That would go onto be the final score, dropping the Hawks to 0-3 on the season, while the Saints moved to 3-1. 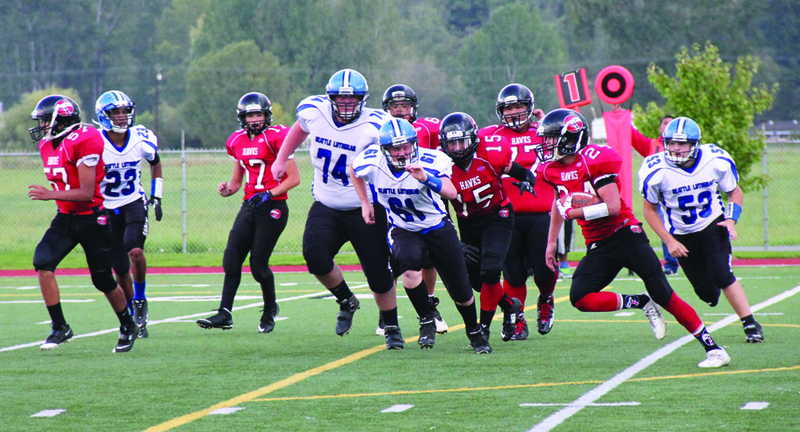 For the Hawks, their next home game will be Saturday, October 10, when they host the Neah Bay Red Devils. 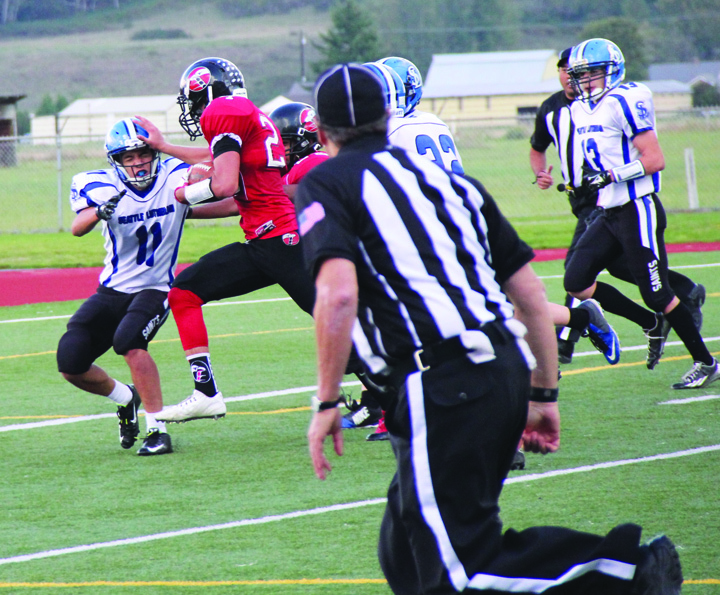 This entry was posted in Sports, Tulalip News and tagged football, Hawks prep football, Seattle Lutheran Saints, Tulalip Heritage Hawks by Kim Kalliber. Bookmark the permalink.